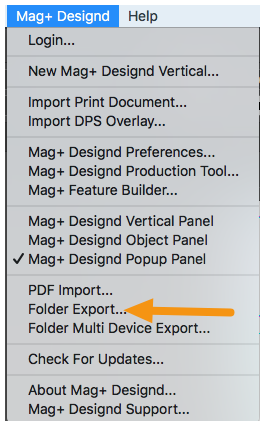 Traditionally when you're making a mag+ issue, you open an InDesign document, work on it, and when you're done, click Export to send it off to your Issue Folder, where it can be read by the Production Tool. With this new script, you no longer have to export on a document-by-document basis—instead, it will export an entire folder full of InDesign documents for you. In essence, it's just an automated way to open, export and close a series of documents. That means you can design, save and then move on to your next doc. When the issue is done, run this script and go to lunch. What's great is that it will even read sub-folders, so if you're using the new multi-device export, and end up with separate folders for iPad, iPad retina, Android and Fire, you can just point this script at the parent folder and it will export all of them, separating them into separate issue folders by device. Note: This is not the same as multi-export in the plug-in. 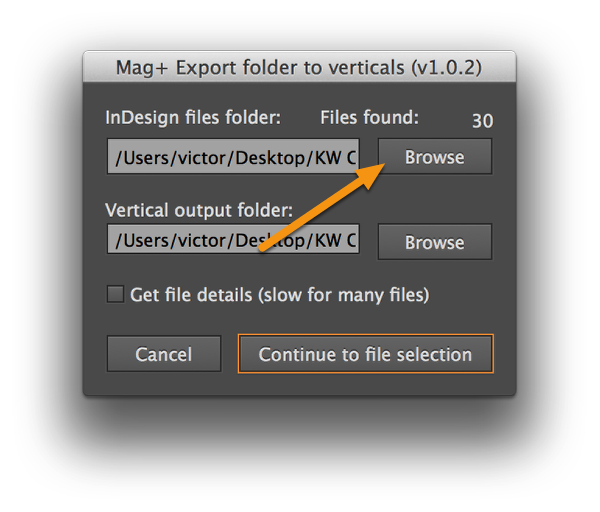 This will not create new InDesign files or exports, it will only batch export InDesign files that exist. 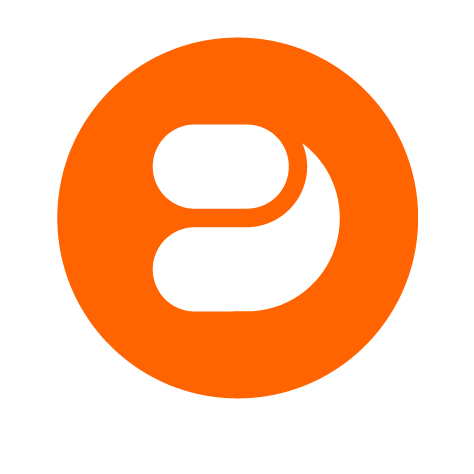 The script is automatically installed when you run the 3.5.1 or later installer. 1. 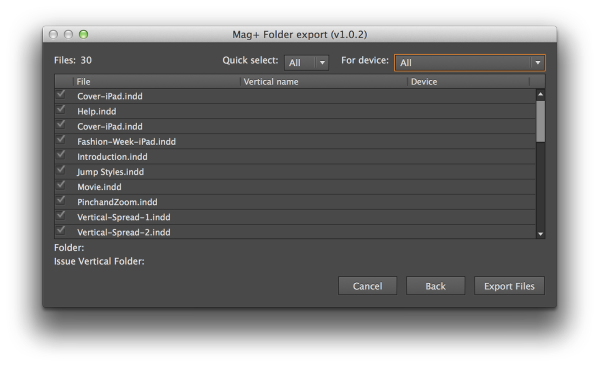 In InDesign, go to Mag+ Designd -> Folder Export... in the menu bar. Note: You do not need to have a document open to run this script. 2. 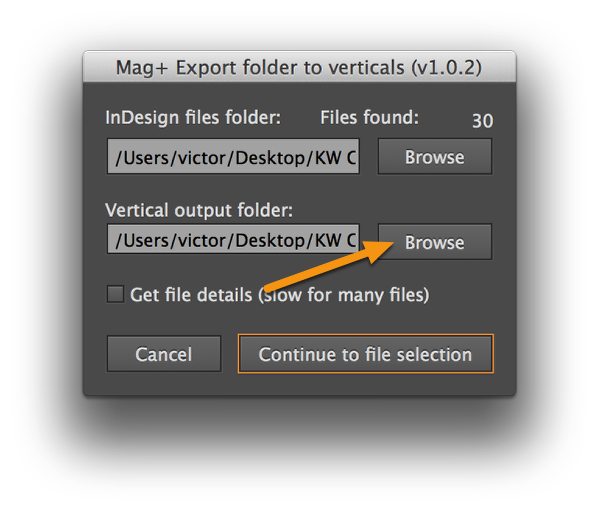 Click the top "Browse" button and choose a folder containing InDesign documents. Note: The script will find documents in nested folders. 3. 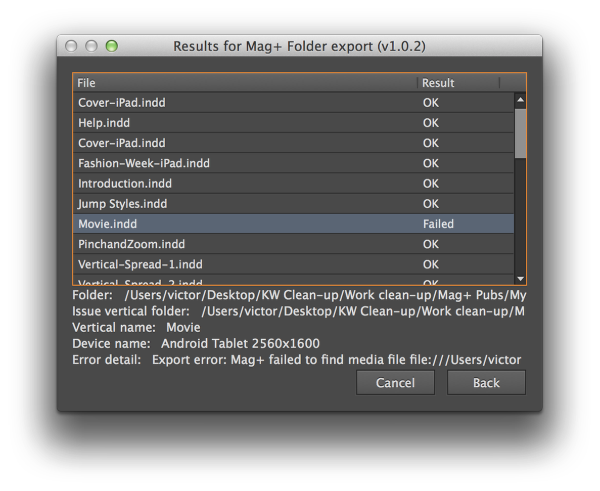 Click the bottom "Browse" button and point to the parent issue folder you want to export to. Note: The script will create folders for each device it finds in the parent folder. If you check the box for "Get File Details", the next dialog box shown will display the File name, the Vertical name (as you set in the plugin) and the device the document is intended for (as determined by the template it was built on). If you do not check this box, it will only show the File name. Note: Print documents will also show in the dialog box but the device field will be blank and they will not export. 4. Click "Continue" to file selection. In the dialog box that appears, all documents found in the folder will be listed and be automatically selected for export. You can deselect a document by double-clicking it to uncheck it. You can also use the dropdown menu filters at top to filter by device. Note: If you use the dropdown filters, all files will still be checked but only those you've selected via the dropdown will be exported. When the export is finished, you will see a status dialog box. If you see that an export failed for a particular document, you can select that line to see why (often it is because the path to an embedded movie or HTML file is broken).